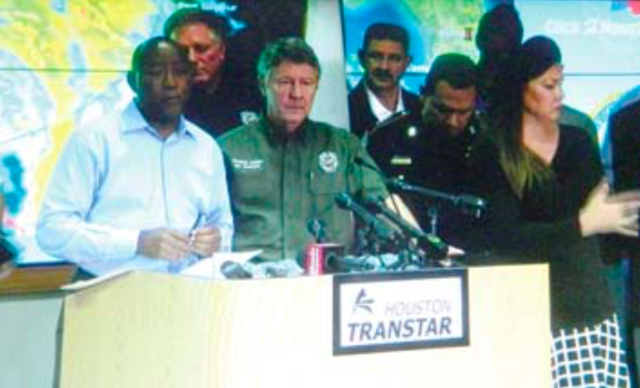 Harris County Judge Ed Emmett, and Houston Mayor Sylvester Turner, coordinated rescue efforts from the Transtar Headquarters. Hurricane Harvey approached the Texas coast slowly the last week of August, and then on Saturday September 2nd torrential rains started and continued for two days. After that, the fun-off and release of damed water brought severe flooding to a number of Houston and Harris County neighborhoods. Jackie Young (San Jacinto River Coalition) and Scott Jones (Galveston Bay Foundation) explain how the river channel can be changed in a strong weather event such as Hurricane Harvey, and damage or dislodge the waste pits. 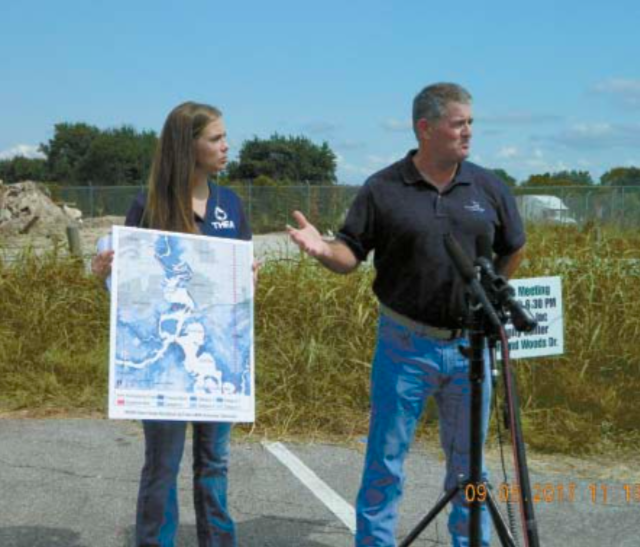 EAST HARRIS COUNTY – The San Jacinto River Coalition, and the Galveston Bay Foundation, held a joint news conference Tuesday, Sept. 5 to call attention to the potential damage to the Waste Pits caused by Hurricane Harvey, and the subsequent flooding of the San Jacinto River. Scott Jones of the GBF called on the EPA to make a thorough inspection of the waste pits, looking for failure of the Cap that now is meant to contain the toxic materials. He also said that EPA has had enough time to answer comments, and make a Final Decision on the method to be used to solve the problem. Jackie Young of the SJRC said that residents along the river were fearful of returning to their homes, not knowing if any of the toxic material was on their property, in their homes or in their wells. Using a map of the river, she pointed out that it narrowed as it went past the waste pits and under the I-10 bridge. This means that the velocity and strength of the river is greater when it is necked down, and therefore the waste pits are at greater risk of dislodging. Young pointed out that the membrane and rock cover over the pits has required repair work each year since it was placed. She raised the question of how many times the Cap would be damaged and need repair, if left their the 750 years that it would take for the material to degrade. In an exclusive interview with the Star-Courier, the contractor for the membrane, Brett Crawford of EcoSeal Protective Coatings, said that the type of membrane installed over the Waste Pits by his company would not withstand long term use, and ultra-violet light from the sun would eventually cause pinholes and deterioration of the ability of the membrane to contain the toxic material. Scott Jones said that after the flood from the hurricane, that the rock cover had been displaced and some of the fabric membrane had peeled back. In fact, workmen could be seen in the background of the press conference area, working on the Cap to correct these very problems. Bumpers meant to protect the I-10 bridge were damaged by Harvey. 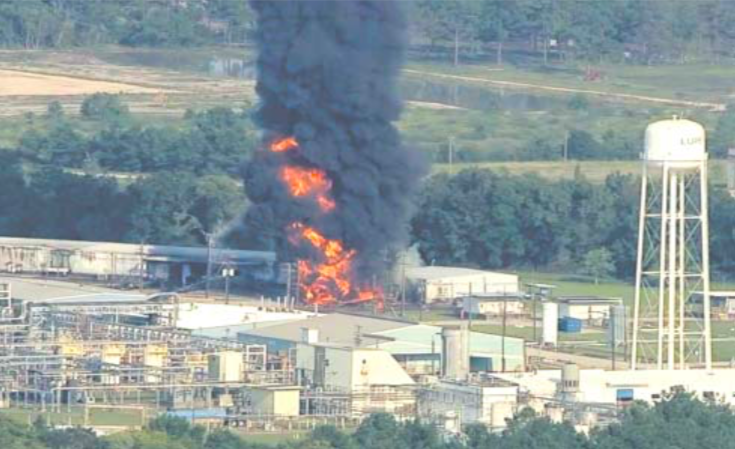 The Arkema chemical plant in Crosby had multiple fires and explosions, due to flooding and power failure of refrigerated chemicals. CROSBY – Locals are returning home near the Arkema Chemical Plant in the 18,000 block of Crosby Eastgate, that was subject to explosions and fires for almost a week now as of Monday, Sept. 4, now to contend with flooding issues that arose from Hurricane Harvey and Tropical Storm Harvey. 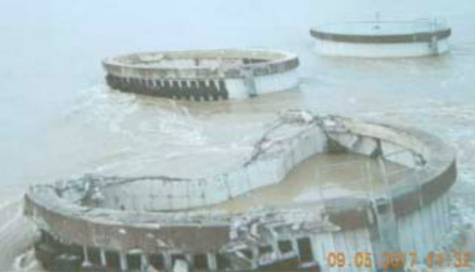 Officials say that an active investigation of the Arkema incidents are underway. The area was evacuated on August 29 at about 2:00 p.m. and US 90 closed at Bohemian Hall. Inquiring residents were told the evacuation was mandatory for 1.5 miles from the plant and that if there were explosions they would not be dangerous outside that area. The closing of US 90 was backed up to Lindstrom Road the following day. On August 31, the first of a series of fires errupted inside the plant at about 2:00 a.m. Irritated eyes and throats of about 15 law enforcement officers were reported by Sheriff Ed Gonzales of the Harris County Sheriff’s Office. 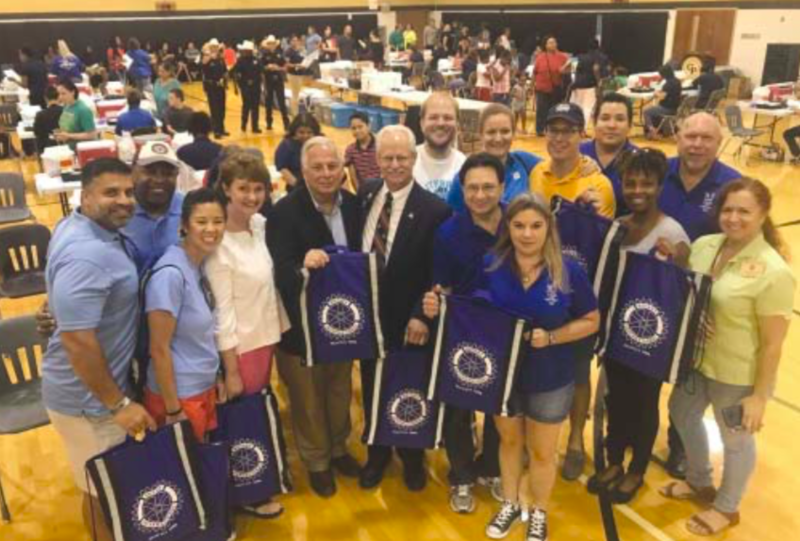 Congressman Green and Rotary District 5890 Governor Bill Palko, center, are joined at Galena Park High School by other Rotarians, who donated backpacks, medical and school personnel at the free immunization clinic last Saturday. In the background, hundreds of students attended the event. Students in North Channel were headed back to school this week and last, but not before they got their immunization shots. Congressman Gene Green, with the help of several Rotary clubs, Walgreens, and others, held three clinics last Saturday for free shots. These were in North Houston, Galena Park, and Southeast Houston. School started for Channelview students last week on Wednesday, August 16, for Sheldon students on August 22, and Galena Park students August 23. Furr High School will start on Monday, August 28. Green was extremely busy this August, which is Congress’ break. He has completed four Town Hall meetings, and will hold another at North Shore Community Fellowship Church, 444 Maxey Road, on Tuesday night, August 29 at 6:30 p.m. He also held a Senior Citizens Forum on Tuesday in Aldine. In October, he will host a Paying for College Workshop and Academy Day, and a Northside/Aldine Job Fair. Green’s Eastside office is at 11811 I-10 East, Suite 430, and can be reached at 713-330-0761. Congressman Green speaks to the large number of students at the Back2School event at Galena Park High School. Rotarian Maria Rodriguez says these shots don’t hurt… much. Houston, TX. – August 21, 2017 – A U.S. Marine received his commissioning as Second Lieutenant at the San Jacinto College North Campus at a presentation ceremony last Monday. The United States Marines Commissioned Marine Corps Second Lieutenant Jovahny Monterrubio, a graduate of San Jacinto College and the University of Houston. Monterrubio chose the Monument Room of the Slovacek Student Center for the ceremony. Family, friends, former co-workers and classmates were present to witness the presentation. 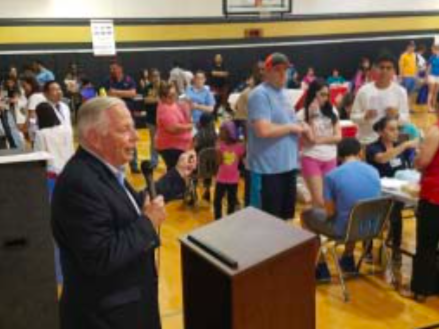 Congressman Gene Green presented a Congressional Resolution honoring Monterrubio. RED INDICATES NEW OVERPASS 1100 FEET LONG, AND APPROACHES TOTAL 2760 FEET. PURPLE INDICATES FRONTAGE ROADS AND TURN-AROUNDS. Federal Road in East Harris County was the site this Wednesday morning of a Groundbreaking for a new overpass, that promises to relieve the long waits many drivers have experience at the pair of railroad tracks that cross Federal and lead into the railroad yard. Drivers headed to or from the Washburn Tunnel, or Clinton Drive, have reported many delays due to the activity of the Port Terminal Railroad, which blocks the road with crossing gates and trains. However, a partnership of federal, state, and county government agencies has worked out a solution to this problem, which is an overpass over the railroad tracks. On Wednesday morning, in the traffic circle in front of the Washburn Tunnel, officials gathered to start the $16.32 Million project, officially known as the Federal Road Grade Separation Project. Jacinto City, TX. 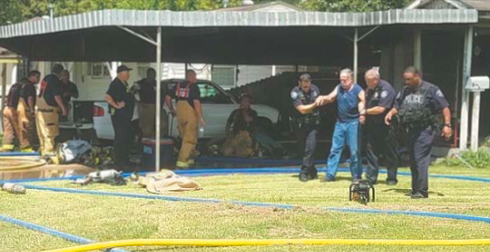 – Tuesday August 15, 2017 at 11:30 AM fire departments from Galena Park and Cloverleaf arrived to assist Jacinto City’s fire department at a house fire in the 10300 block of Lane Street. The fire filled the sky with dark smoke, seen from I-10 to Galena Park. Galena Park Fire Chief Paul Gregory said the three departments together had 18 to 20 firefighters on the scene. ran to his door and got him outside, where arriving police and firemen got him to safety. 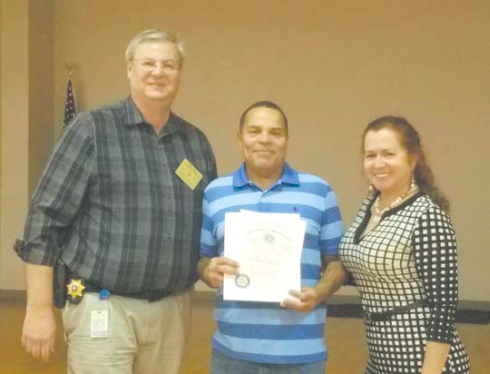 ERIC BROUSSARD, center, was welcomed at a recent Rotary Luncheon as a new member of the Galena Park/Jacinto City Rotary Club. Broussard is a City Commissioner in Galena Park. Seen with him are Bryan Clements, president of the club, and Maria Rodriguez, membership chairman. If you are interested in becoming a member of Rotary, call 713-539-8021 for more information. The club is currently conducting a membership drive, and would welcome you as a guest at an upcoming luncheon. Constable Diaz and Chamber President Margie Buetello talk after the luncheon, which was held at the Towne Center in Jacinto City. Harris County Pct. 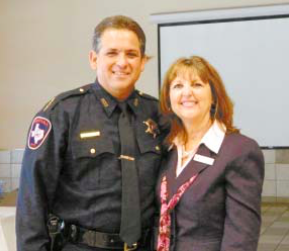 2 Constable Chris Diaz was on familiar ground last Friday, when he was the speaker at the North Channel Chamber’s monthly luncheon. The event was held at the Jacinto City Towne Center, where Diaz was once city councilman, and then Mayor. Accompanying him at the head table was Ana Diaz, his wife and current mayor. Diaz made a lively presentation, explaining the organization and functions of a Constable’s office. – Community Services, including such activities as National Night Out, Easter Egg Hunt, Parades and other events involving participation in the community. HOUSTON, TX – Congressman Gene Green will be hosting his Annual Immunization Day on Saturday, August 19, 2017, from 9 a.m. to 12 p.m. at three locations in the 29th District, which are listed below. In addition to providing free immunizations for children, the event will give parents an opportunity to speak with Congressman Green about preventive health initiatives.